On Wednesday, May 17 at 6:30 PM, two serious birding specialists, renowned researcher, lecturer and naturalist David Clapp and Ray Brown, host of Talkin’Birds and WCRB classical music programs, will treat you to a lecture with slides about the birding environment in the Galapagos. Clapp, who has led Smithsonian Journeys trips for many years, has taught at Northeastern University and worked with conservation organizations worldwide for decades. He has been with the Massachusetts Audubon Society most of his professional career, trained up-and-coming naturalists, and studied many species of the avian population. Brown, who joined the WGBH many years ago, is a regular contributor to NPR’s Weekend Edition with Scott Simon where he illuminates the audience about the latest news in the world of birding. Last year, Brown gave a very well-received presentation at the South End library about bird migration patterns, called The Magic of Migration, as part of the Local/Focus Urban Birding installation in the library’s Tremont Street windows. This year, he organized a birding tour to the Galapagos in late September with the Sunrise Birding nature company, and will have information available for anyone who might want to join to fill the last two cabins. Brown is a longtime South End resident. His Talkin’ Birds show is now heard on 16 stations around New England, and in the larger world through streaming and podcasts. Guests on his show include avian aficionados and birding luminaries like David Sibley, Sy Montgomery (Birdology) and Donald Kroodsman (The Singing Life of Birds) as well as experts from birding conservation organizations such as the Cornell Lab of Ornithology, the National Wildlife Federation and the American Birding Association. 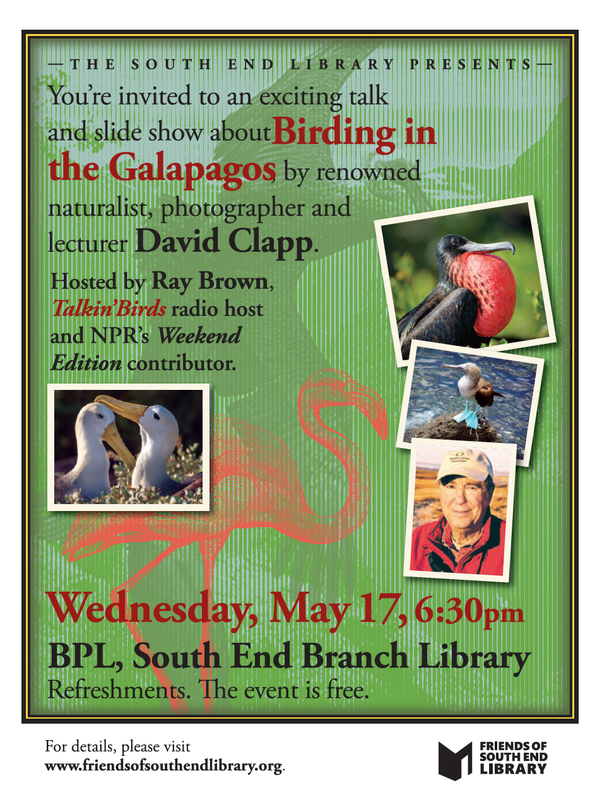 The Galapagos talk is free to all. Refreshments are served.